Energy reliability and resiliency is top of mind for many companies as cybersecurity becomes more of an issue for utilities, and climate change brings with it an increased threat of natural disaster. These challenges and more are paving the way for substantial progress in decentralized energy resources. 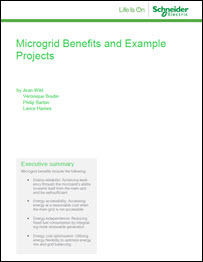 A new white paper from Schneider Electric, “Microgrid Benefits and Example Projects,” explores the role of microgrids in improving energy reliability and resiliency. In fact, some think energy decentralization and technology like microgrids will help solve the energy challenges of the 21st century. Schneider Electric points out that recent headway in decentralized energy resources (DER), such as solar energy and storage, are driving new developments and optimization in microgrid technology. The Internet of Things (IoT) is also fueling new cooperation and projects. So, why microgrids? The new report outlines the many benefits of microgrids, including energy reliability, better resiliency, easier access to energy through a less capital-intensive, modular, scalable solution that is quicker to implement, more choice around when and how to interact with the grid and energy cost optimization. Energy flexibility also offers the ability to optimize energy mix and grid balancing — determined by your business needs. Microgrids achieve resiliency through their ability to island from the main grid and be self-sufficient. Islands of Tonga rural electrification project for villages. When the grid encounters a problem, microgrids can separate from the main grid and still continue to provide energy from local sources. And users can get ahead of potential problems — for example, the threat of a predicted heavy storm — by preparing their microgrid and implementing a precautionary strategy like charging batteries and cutting down on non-vital energy loads. 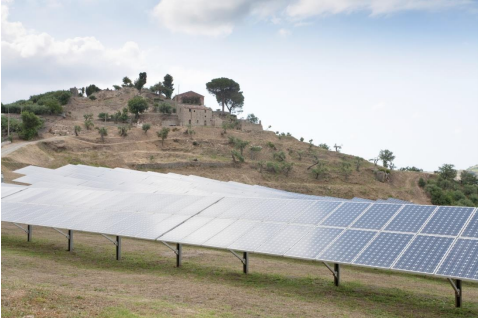 To illustrate the energy reliability that can be achieved through the use of microgrids, Schneider Electric walks readers through the specifics of a variety of successful working microgrids, including examples of military microgrids, remote microgrids and more. Microgrids are a catalyst for the energy transition. Microgrids are already being used successfully to serve a variety of industries and sectors dependent on energy reliability and resiliency, including the military, the medical industry, college campuses and more. 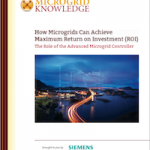 Download the white paper, “Microgrid Benefits and Example Projects,” courtesy of Schneider Electric to read more on how microgrids are improving energy reliability and resiliency.